Pinball predates video gaming by many decades and once dominated amusement arcades around the world. 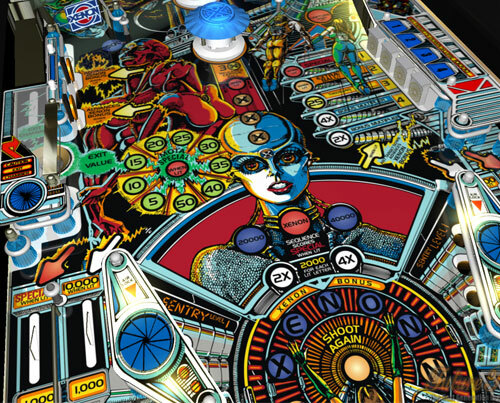 At its best, Pinball is timeless fun, with broad appeal. Thanks to Future Pinball, many games new and old, can be adapted for greater access. To play the games listed below on a modern PC you will need to use the Future Pinball Emulator alongside "FPT" files for each game. Some files may need to be unzipped first. A powerful PC is a must for smooth play. For one-switch play you will need to go the "Preferences" drop-down menu then select "Game Keys and Controls". From there you will need to set all flippers, the plunger and the start button to the same key (e.g. LEFT SHIFT). Assigning an accessibility switch to act as this button will allow for one-switch play. Accessible Centaur by Light66 - adapted by OneSwitch. Very noisy 1981 Bally Pinball machine with heavy metal fantasy theme. Features include: Flippers moved close together; Tilt disabled; Freeplay on; one-switch play. Issues: Highscore mode requires the use of the "ENTER" button to enter initials. Accessible Ignition by Light66 - Slash2084 - Sebek74 - Akarimco - adapted by OneSwitch. Space themed pinball based on an Amiga classic. Features include: Right 'outlane' blocked; flippers moved to prevent ball from dropping down the middle; Tilt disabled; Freeplay on. Pure one-switch play possible. OXO (Williams 1973) by Misaligned Cow. Adapted for easier play by OneSwitch. Features include: Both "outlanes" blocked so ball can only be lost down the middle; Peg placed between both flippers; playfield adjusted to make tracking the ball easier; freeplay mode; table slope reduced to slow game down. Issues: Highscore mode requires the use of the ENTER button to enter initials. The Special Effect Roadshow Challenge is a very clear table by Bill Donegan of Special Effect (2009). Try to hit all 10 targets with three balls. The ball can only go out of play via the left "outlane". Players can take part at their own pace. Future Pinball: The home of Future Pinball including their very useful Forum. FPR Release: Unofficial tables list in an easy to browse format. Downloads galore. 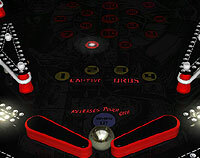 IR Pinball: Many tables to download. Go Pinball: Includes Dark Quest featuring a holographic projector. Blind Man Kind: Modern tables including the rated Three Angels.